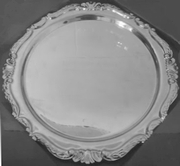 Awarded at Maadi (National Champs) since 2012 to the winner of the Girls under-18 lightweight double, the Plate is currently held by Kavanagh College [KAVA]. The Kavanagh College crew won the event in 2013 by less than a canvas from Epsom Girls Grammar [race results]. Full event results are available for: 2012, 2013. Donated by Keith Hibberd, who coached Macleans for the previous 10 years. Keith's involvement with rowing dates back 50 years; first as a rower for Auckland Rowing Club for 20 years then coaching womens crews before coaching school crews. Keith started with BARA before coaching GLDW and then started coaching MACL.